If you are at work and well addicted to Twitter and don’t want to miss on updates from your fellow tweople.You could try apps like TweetCaster if you have a Smartphone, but your boss could find out that your spending more time on your mobile phone than on the work. If you use MS Outlook as your email client at your office then here’s TwInbox a Twitter plugin for your Outlook that gets well integrated with your Microsoft Outlook Email Client.On installing TwInbox you should see a new TwInbox toolbar at the top of your Outlook window.It can also shorten URL’s using bit.ly. Search, track keywords. 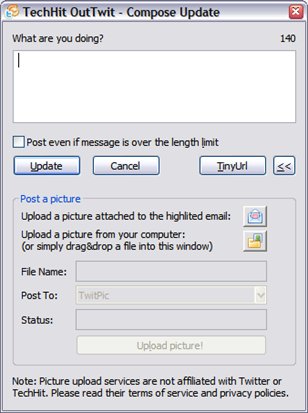 TwInbox will automatically download ALL tweets matching the keywords you specify, even if you are not following the tweet sender. 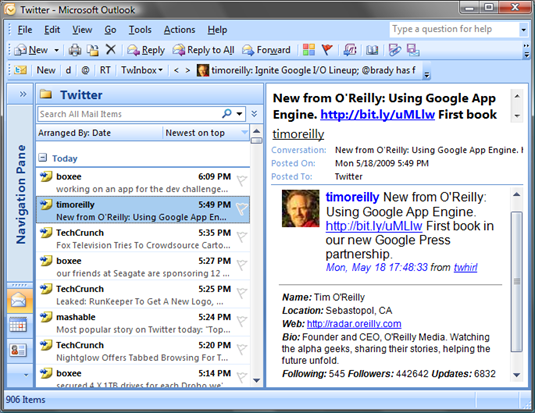 TwInbox supports all Windows OS and Outlook 2003 SP3, 2007 SP2, 2010. Note : TwInbox does NOT work with Outlook Express.